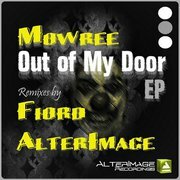 AlterImage Recordings have revitalized techno with the sounds on the ‘Out of My Door’ EP by Mowree. Savage beauty in its approach as each remix defines itself with some serious vocals. The responsibility to optimize ownership of each track is evident. Washing, rinsing, and pulverizing the floor with lathered low end super chug elements as well as full cycle exploration develops as deeper melodic ceiling gliders whisk the hypnosis into an apocalyptic pulsing sonic life form. The EP provides an array of auditory variables that could find themselves played at different times and moments. I feel that the AlterImage Rmx has the most technologically advanced sounds while the original has a more rawer organic tribal feel. The tech-house groover ’Lets Celebrate’ lacks luster but overall The ’Out of My Door’ by Mowree off AlterImage Recordings has some fresher sounds while others are forgettable.